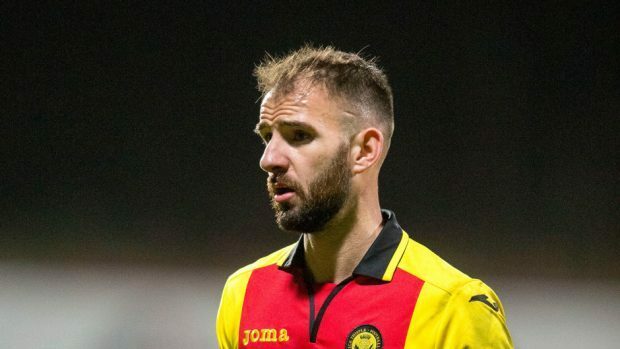 Sean Welsh previously played for Partick Thistle. Caley Thistle manager John Robertson says midfielder Sean Welsh has apologised to his team-mates following his red card in Tuesday’s 3-1 friendly victory over Brora Rangers. Welsh was dismissed in the latter stages of the match for his part in an altercation with Cattachs striker Kyle MacLeod, in his first outing for Inverness since joining from Falkirk earlier this week. The 28-year-old had netted two goals earlier in the match. The red card for violent conduct from referee Billy Baxter is now likely to result in a two-game suspension which is expected to come into play for Tuesday’s Betfred Cup tie at home to Raith Rovers. Robertson felt Baxter could have avoided brandishing a red card but says Welsh has addressed his fellow Caley Jags players following the incident. Robertson said: “It was a wee bit harsh on him but I can understand why the referee chose to do what he did. I think that gets reported now so we will probably lose him for a couple of games. “We can’t do anything about it now, we’ve just got to deal with it. “Sean is very apologetic and he will be dealt with in our disciplinary code, because that’s what we do. We don’t just accept the fact the player was wrong. “The player has overstepped the line so therefore he will fall prey to the code of conduct the players have. He’s looked at by them first, and then anything more so that we feel is above and beyond, and they get dealt with directly by myself. Robertson revealed fellow midfielder Angus Beith, who joined from Hearts earlier in the summer, has suffered a setback in his recovery from a hip injury, but remains on course to return for the opening Championship match away to Falkirk on August 4. Robertson added: “Angus has had a reaction. We knew he had surgery and he was making great strides, he was doing his running and had joined in the running sessions. “He had a wee reaction to a bit of scar tissue, so we are just looking at that. There’s a delay there, but we knew there was going to be. “Angus is frustrated, he wants to get involved. But after the injury he has had and the surgery he has had on it, it would be foolish to rush him back before he’s ready.